If you’ve ever felt indecisive about which Ferrari to get whilst in the showroom, then this app is for you. 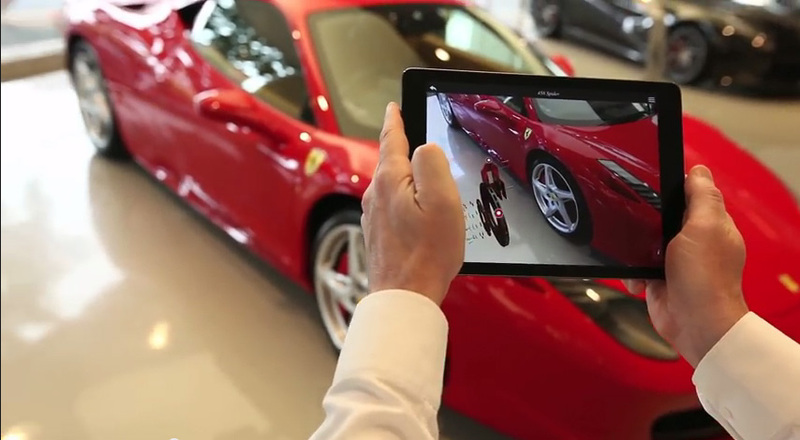 Zspace has developed an augmented reality app for Ferrari cars, using 3D tracking technology to superimpose colors, shapes, and even videos in real-time on the cars. All you have to do is stand in front of your Ferrari (or turn up at a showroom) and hold it steady. You can virtually change the car’s rims, brakes, paint job, and more. It will also show you an X-ray view of the car, showing you its components and even a visualization of it in a wind tunnel. It sounds awesome, to say the least. The app works by tracking the car’s edges. When you point the camera at a Ferrari, it judges the distances between the panels, wheels, and other parts. Then it overlays the chosen graphics—you can change the colors, try out new rims, figure out which shade of red to go with, and so on. For the time being, the app only works with five models: the 458 Speciale and Spider, the F12berlinetta, the FF, and the California. The technology could be expanded on to Ferrari’s other cars, but of course it’s at the company’s discretion. It’s currently being rolled out in Japanese and Australian showrooms; the US will probably get it within a few months. This sort of technology isn’t exactly new. Volkwagen used it in 2013 to show technical information for its hybrid concept XL1 car. It was also used to visualize real and virtual parts side-by-side, and it worked great. I hope to see this expanded to other car manufacturers someday. Lamborghini would be exceedingly cool.